LAOS 2003 STAMPS MNH THE ORCHIDS. Orchids are endemic in the jungle of the central part of Laos and in Southeast Asia, and they become the rare botanical pieces at present. They may be grown for housing decoration or other purposes and are sold for income together with other varieties of flowers. 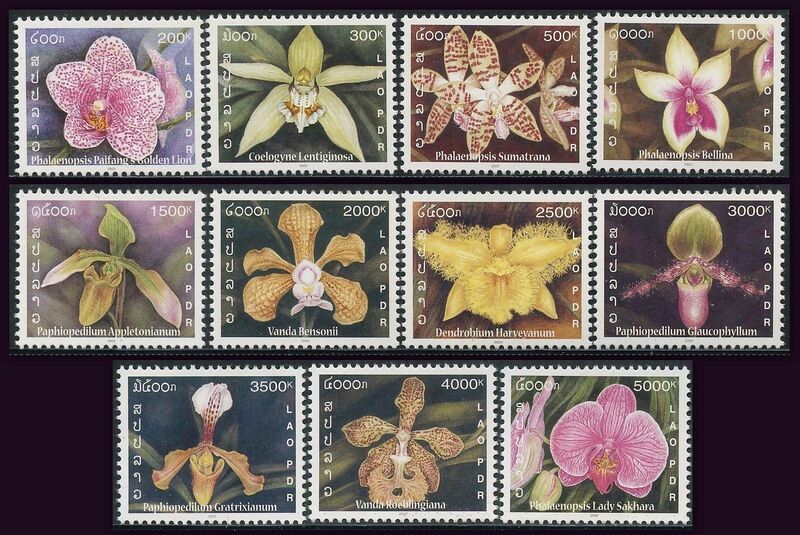 To promote the conservation of the scarce orchid, the Entreprise des Postes Loa has issue 11 postage stamps featuring a series of orchids as follows : Coelogyne Lentiginosa, Dendrobilum Haveyanam, Paphiopedilum Gratrixianum. Phalaenopsis Bellina, Phalaenopsis Lady Sahara,Phalaenopsis Paifang’s Golden Lion, Phalaenopsis Sumatrana, Vanda Bensonii, and Vanda Roebiingiana. Item is in Mint Condition As In Picture. Get It Before Its Gone . Save The Vintage For The Future.